What are the challenges with PowerShell Logging? PowerShell can generate an overwhelming volume of log data, especially for scripts running frequently. Teams often lack the proper tools to manage and archive these logs. Logging is a critical element of running PowerShell scripts, especially with the increased security risks these scripts can introduce. Unfortunately, sheer volume of log data can make it difficult to track and analyze events. Teams often end up relying on complex integrations for parsing, filtering, and searching log files. There is no easy way to visualize or analyze PowerShell logs, which can slow down troubleshooting. Frequently tracking issues requires toggling between multiple tools and views, making it difficult to see patterns and trends. For a comprehensive view of PowerShell activity, you need to enable three logs sources: module logging, script block logging, and transcription. The combination of these three log sources produces a complete record that is essential for troubleshooting and identifying security incidents. Managing the large number and size of log files, however, can be a real challenge—and this is where SolarWinds® Loggly® comes in. Their cloud-based log aggregation service is designed to manage large log volumes and help with this. Loggly simplifies log collection and analysis, and provides a centralized view into your log data. The agentless architecture means there is nothing to deploy or maintain, and Loggly provides a fast search even through large data volumes. Manually parsing PowerShell logs is time-consuming and tedious. Loggly can automatically parse your logs and even provide you with analytics for faster troubleshooting. Automated parsing helps ensure you get quick results for your searches, even across large log volumes. Additionally, Loggly allows you to browse through the logs using dynamic field viewer, which presents log information in a structured manner. For instant visibility, you can use a command line to tail PowerShell logs and quickly debug issues. You can also integrate Loggly with popular notification services like Slack and Hipchat for real-time alerts. Loggly helps visualize your log data, while also simplifying analysis and reporting tasks. You can use different types of charts to capture simple log event counts and even more complex metrics. These charts can be dragged, resized, and displayed on shareable dashboards, providing a command center view to your team. 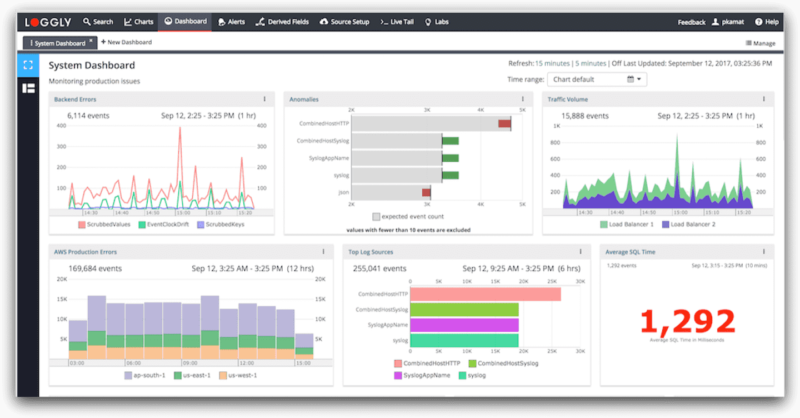 Clicking on a spike or outlier in a dashboard will immediately bring up the associated logs to quickly identify issues and speed up resolution. You can download dashboards as PNG images and immediately share them over Slack or email to communicate in near real time with your team members. Even better, Loggly integrates with Jira, Github, Slack and other tools commonly used by the DevOps professionals, allowing you to easily collaborate across your team.